First step is to clean, use cleaning solvent emulsion cleaning the steel surface, in order to achieve the removal of oil, grease, dust, lubricants and similar organic matter, but it can not remove the steel surface rust, oxide, solder medicine. Second step is to right tools rust, rust tools you want to have to use a wire brush, wire brush to remove loose or warped oxide, rust and slag. 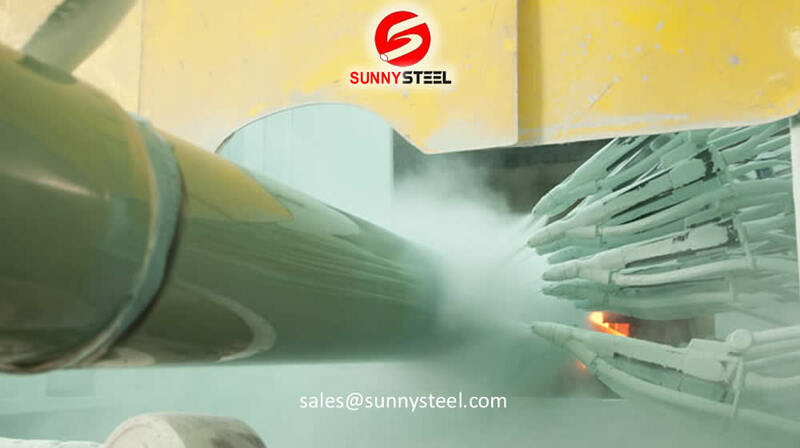 To achieve the desired effect of the rust, the hardness of the steel surface must be based on the original extent of corrosion and the required surface roughness, coating, etc. to select the type of abrasive, the epoxy layer, two or three layers polyethylene coating, using mixed abrasive grit and steel shot blasting easier to achieve the desired effect. Third step is to do pickling, chemical and electrolytic pickling generally use two methods, using only chemical pickling pipeline corrosion. Although chemical cleaning can achieve a certain surface cleanliness and roughness, but there are some pollution to the environment. Finally emphasis on the importance of surface treatment in the production, strictly control the process parameters when anti rust. Fusion Bonded Epoxy – Fusion Bond Epoxy is a powder epoxy thermosetting coating applied for anticorrosion protection to steel pipelines. The pipe is first blast cleaned and heated. Then epoxy powder is spray applied by electrostatic guns to melt and form a uniform layer that hardens within a minute from application. Utilizing industry accepted materials supplied by manufacturers such as 3M, DuPont, and Valspar, the facility can apply FBE in a wide range of thickness to cost effectively meet any project specifications. Fusion Bonded Epoxy with Abrasion Resistance Overcoating (FBE/ARO) – Utilizing two completely separate powder systems, the facility can produce FBE with an ARO at unprecedented processing speeds using industry accepted materials such as 3M 6352, DuPont 7-2610, and Lilly 2040. Fusion Bonded Epoxy with High Temperature Resistant Overcoating – Utilizing two completely separate powder systems, the facility can produce FBE with a high operating temperature resistant overcoating such as DuPont’s Nap-Gard Gold and 3M’s 6258. 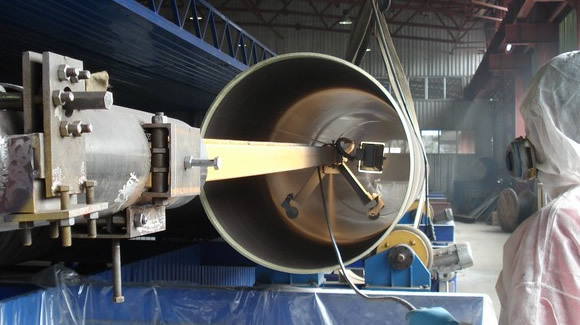 Fusion Bonded Epoxy with Zap-Wrap Overcoating – The facility is capable of processing line pipe with connections and of applying the Zap-Wrap abrasion resistance overcoating to the ends of each pipe. To improve anticorrosion performance and adhesion, an additional layer of epoxy primer is sprayed onto pipe surfaces prior to the adhesive layer and Polyethylene top layer application. Three Layer Polyethylene is suitable for service temperatures from 60°C to 80°C (85°C peaks). 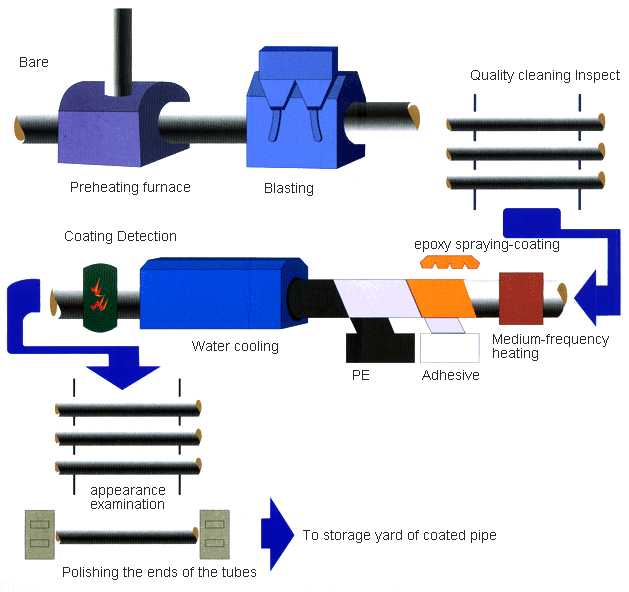 Typical coating thickness is from 1-2 mm to 3-5 mm. If a wider service temperature range and high stiffness is required, adhesive and top layers, applied over primer layer, are based on polypropylene instead of polyethylene. Three Layer Polypropylene is suitable for service temperatures up to 135 °C (140°C peaks). Typical coating thickness is from 1-2 mm to 3-5 mm. 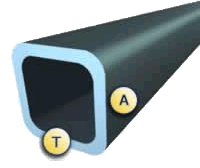 Three Layer applications involve a thermoplastic coating applied to steel pipelines as a form of anticorrosion protection. This mechanical resistance is appropriate when the risk of particularly severe coating damages exist. The Three Layer process involved several steps. First, the pipe surface is blast cleaned to remove any external residue from the mill or storage. It is then heated and sprayed with a Fusion Bond Epoxy (FBE) primer followed by the application of an adhesive copolymer and polyolefin polymers that are wrap extruded, one over the other. 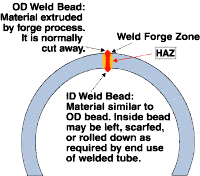 Welded steel pipe (steel pipe manufactured with a weld) is a tubular product made out of flat plates, known as skelp, that are formed, bent and prepared for welding. What is Galvanized Steel Pipe? Galvanized steel can be made into a strong plumbing or tubing material -- one that resists corrosion from exposure to water or the elements. It has been used used for water-supply pipes or as a strong tubing for outdoor applications. How should paint galvanized steel pipe ?